Visit us in person (or online!) for the latest “creative finds for creative minds.” Artistic Artifacts is located at 4750 Eisenhower Avenue in Alexandria, VA (directions below). No matter your medium, you’ll find creative products and found objects perfect for the contemporary fiber/mixed media artist! Looking for a gift for your favorite Creative Mind? Check out our gift section, which includes the Artistic Artifacts Gift Certificate! Artistic Artifacts was chosen as one of the Top Shops featured in 2018 by Quilt Sampler® and is offering your color choice of kits to complete our magazine-exclusive quilt! If you missed this on the newsstands, purchase your issue from us! We are home to exciting fiber and mixed media classes with renowned local and international instructors! 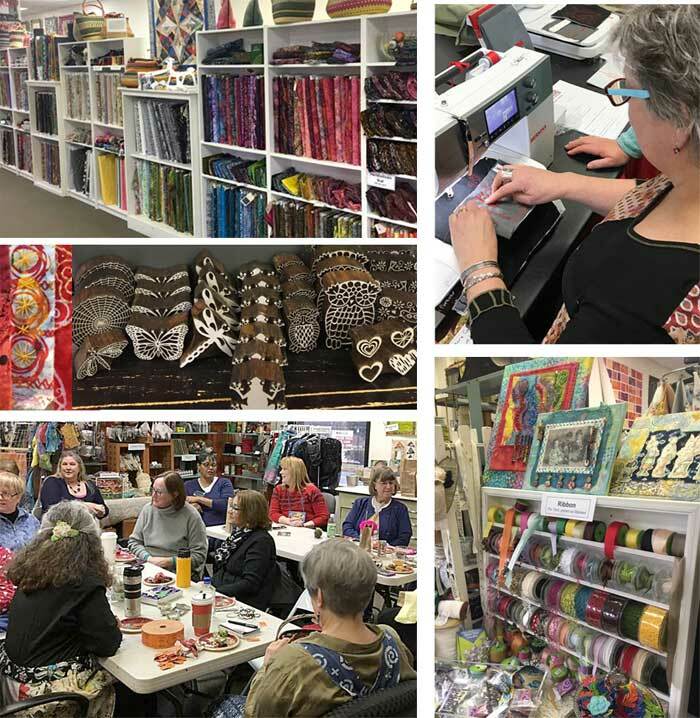 We encourage our customers to join us monthly for our “How Do I Use This?” demonstrations and play-time, and the 3rd Sunday of each month for Judy’s Altered Minds (JAMs), an altered art group open to all. JAMs attendees gather support and encouragement for their art, participate in demonstrations of techniques and group challenges, and enjoy the camaraderie of like-minded friends! We are proud to be a place for artists to gather and periodically hosts exhibits and shows. Rental space is available; see more below. To visit Artistic Artifacts, take the Washington Beltway to exit 174, Eisenhower Avenue Connector. After exiting onto the ramp and merging onto the Connector, you will come to an intersection: take a left onto Eisenhower Avenue. 4750 Eisenhower Avenue is a red brick building approximately ¼ mile on the left, after the Fedex sign and before a condominium complex — look for the Artistic Artifacts sign. The Van Dorn Street station, on the Blue Line, is located at 5690 Eisenhower Avenue, approximately 10 blocks (.720 miles) from Artistic Artifacts. The shop is on numerous bus routes too. Artistic Artifacts is a proud member of the Alexandria, VA Convention and Visitors Association! Alexandria is nationally recognized for its rich history and beautifully preserved 18th- and 19th-century architecture in Old Town Alexandria and known for acclaimed, chef-driven restaurants; a thriving boutique scene; vibrant arts and culture; and a welcoming, walkable lifestyle. Named the #1 Best Value U.S. Travel Destination 2018 by Money magazine and one of the South’s Prettiest Cities 2018 by Southern Living, Alexandria is the relaxed and refined home base for your D.C. vacation and an unforgettable getaway of its own. Visit www.visitalexandriava.com to learn more. For those who are traveling from out of town to attend a class held at Artistic Artifacts, VisitAlexandriaVA.com lists numerous hotels. The following options are located just minutes away from our shop. Comfort Inn & Suites Alexandria VA, located at 5716 S. Van Dorn St. Hold Your Event at Artistic Artifacts! 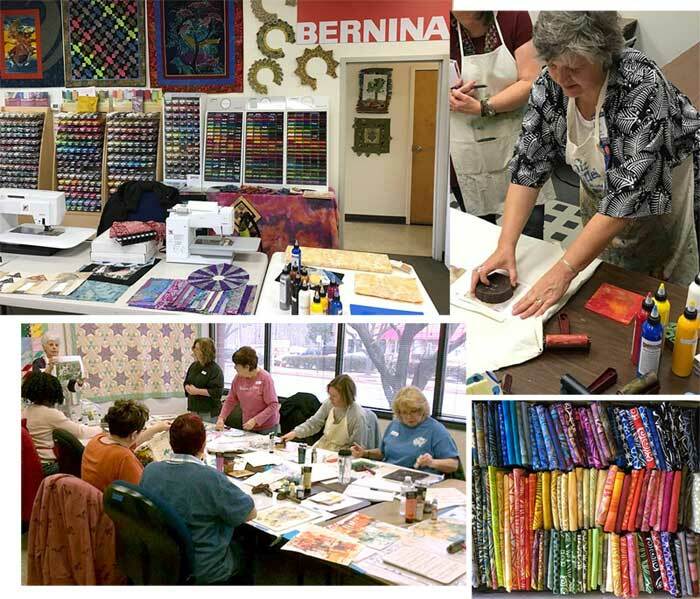 Would you like to hold your quilt bee/fiber/art group meeting at our store? Interested in a demo and hands-on embellishment experience? Space is available to accommodate up to 40 people for your meetings, charity work sessions, arts organizations, guild workshop rentals, and more (a modest supply fee may apply for demonstrations). Request rental rates and availability. We are closed each Monday and on major holidays; please visit our Calendar for complete information. After a few years in retail, Judy joined her family’s auto accessory businesses which were housed at 4750 Eisenhower Avenue for more than 20 years (and now operate online). The businesses boasted their own retail showroom and racing museum in the store front; when the three Porsche Race Cars (not street legal!) moved out, Judy saw wide open underutilized space...enter the physical embodiment of her already established online presence. The shop’s Grand Opening was held March 28, 2008. The space that used to shelter high performance automobiles, their parts and accessories now houses fabrics, embellishments, paint, found objects, ephemera, classroom space and more! 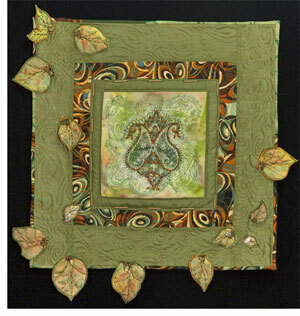 Photo, above right, Green Leaves by Judy Gula, currently featured in First-Time Beading on Fabric: Learning to Bead in Nine Easy Lessons by Liz Kettle.